hehe..fan-bloody-tastic.im lovin little Mr bat! Awesome costumes! Beware though. 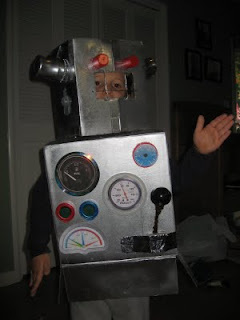 I was that robot costume once and upon descending some stairs at school the back bottom edge of my "body box" caught on a step. My balance tipped off and luckily (I think) I fell backwards. Upon "landing," my box spanned 3 stairs and I proceeded to slide down the entire flight. Can you picture it? I love it! I wish my boys were into being creative with their costumes but they aren't at all. Fortunately they want to be the same thing they were last year - which makes it easy on me. Only now I think we're going to have to add face masks to their costumes because they both have the flu. How can you keep a child from going trick or treating?? Just kidding about the face mask by the way. I won't let me kids go out if they are sick. That robot costume looks fantastic! I lucked out this year as my 4yo decided to be a Workman, which means he'll be wearing what he wears about every other day, but with a tool belt added to the outfit. Eco Yogini: I feel a bat in your future! Jimmy: That's too funny! Watching my son in the school parade costume today, I could totally envision something like that happening. Mindful Momma: Noooo!! Not sick on Halloween!! I know you were kidding but seriously, it is outside, less likelihood of germs spreading . . . Hope they feel better. Daisy, Raven and Melinda: Thank you, ladies! Donna: You lucky dog! He was that last year too, right? Or was it a fire man? Fireman for the last two years. You have a good memory. Awesome idea... I love it! And I think we need a challenge where we turn the kids candy wrappers into a costume for the following year. Oh oh! They can be Candy "Rappers". AAAAhahahaha, I kill myself. 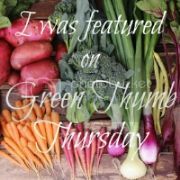 Anyway, I was wondering if any of the caped wonders had interesting posts about unusual uses for baking soda that I could add to my roundup on BlogHer this week. I already plant to link to the post about dish washer soap, but I was wondering if there were any others. Ecofriendly: Thanks for the link! Kellie: Ha! You crack me up too!